In early 2016 I was asked by CeeCee to run one of their ‘lessons’. learning by doing, I decided to make something that is not only good looking but also full of learning potential. Our choice fell to the quintessential all-time classic: the cutting board. 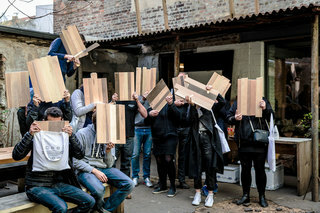 I prepared some pieces of different timber; everyone could choose their favourites to make their own unique piece. 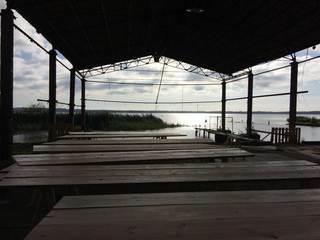 And then we cut and glued, planed and sanded for 3 hours, had lunch, and then chisled, finished and oiled the boards. 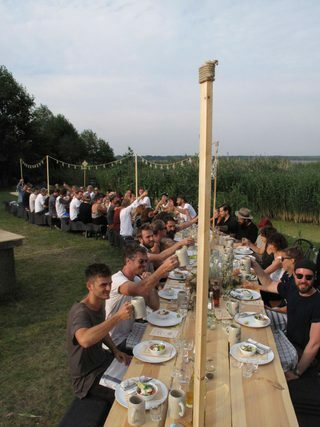 A few weeks later I got a phone call from the team at CeeCee, asking whether I could make a table for a summer break they had organised in the countryside. 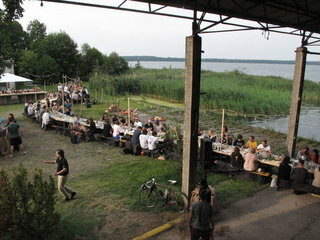 The only catch was that they had invited 200 people for dinner and the table needed to be 60 metres long! My first reaction was to smile, and then I got a little nervous about the size and how I was going to manage the project. 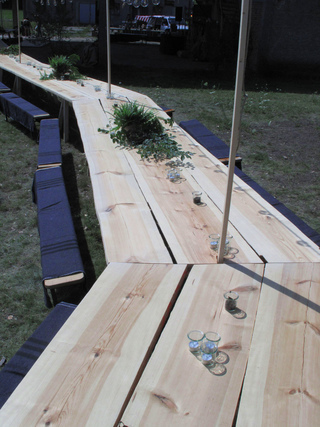 We decided to go for the local grown ‘Märkische Kiefer’ and as the timber does not come in 60 meter long pieces to make 12 tables, each of which were 5 meters long. We arrived at our beautiful spot on the Grimnitzsee 2 nights before the Dinner with a truck full of timber and started making. We had 3 wonderful days at the Grimnitzsee: the weather was good to us, the lake beautiful to swim in and the location was nice and big enough to set up our tent in a quiet spot, as my little boy was only 2 months old at the time.